The Landfill Garden diverted 90 tons of on-site demolition debris destined for the landfill into a visually striking high performance landscape. 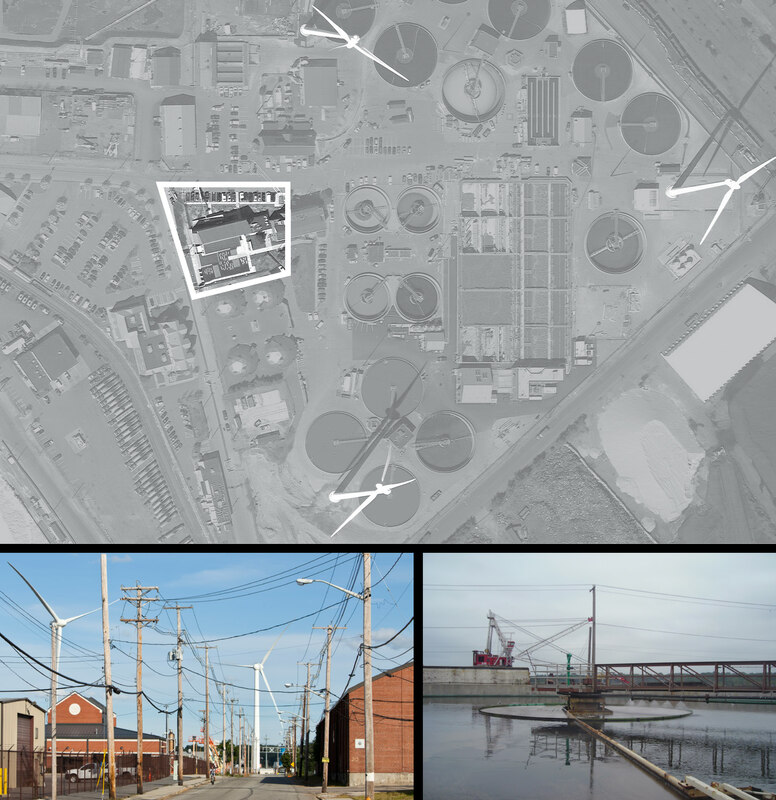 The project is the most public component of new technologies at the Narragansett Bay Commission Wastewater Treatment Facility which includes the world’s largest bio-nutrient removal system, wind turbines, and surface water management. The Landfill Garden re-processed industrial waste into a richly textured black and white composition of crushed asphalt and sawn concrete planks. The Landfill Garden is a component of a $65 million modernization and construction project for the Narragansett Bay Commission’s (NBC) Field’s Point Wastewater Treatment Facility in Providence, Rhode Island that drew on the expertise of scientists, engineers, landscape architects and architects in the design of the Biological Nutrient Removal Project. The overall project substantially reduced the amount of nitrogen and other pollutants entering Narragansett Bay, the second largest bay on America’s Atlantic Ocean coast. NBC’s 52-acre facility is responsible for treating over 200 million gallons of water per day from Rhode Island cities and towns surrounding upper Narragansett Bay. It was originally constructed in 1901, and is one of the oldest municipal water treatment plants in the country. The campus is dominated by water treatment infrastructure, asphalt, and concrete. The new Biological Nutrient Removal Project employs the largest integrated fixed-film activated sludge treatment process in the world for biological nutrient removal. The process reduces nitrogen levels in the Providence River and Narragansett Bay to meet stringent Pollution Elimination System effluent permit limits. A component of the master plan for the new project was the design of a 19,000 square foot Operations Center that would act as a new public facility for the treatment facility and reflect NBC’s dedication to environmental issues and responsible stewardship of the Narragansett Bay. Centered at the base of the three monumental wind turbines that are visible along Interstate 95, the Operations Center site is a complex array of spaces that balance the needs of computer systems, water treatment process monitoring, plant security, staff support areas, administrative offices and education center. The Landfill Garden is part of the Operations Center, in which all of the new computer control systems for Biological Nutrient Removal, the Tunnel Pump Station, the Ernest Street Pumping Station, and Wastewater Operations are located. The central command center and administrative offices are located on the second floor of the Operations Center to provide visual surveillance of the campus. The protection of these view-sheds influenced the location and scale of trees in the landscape. 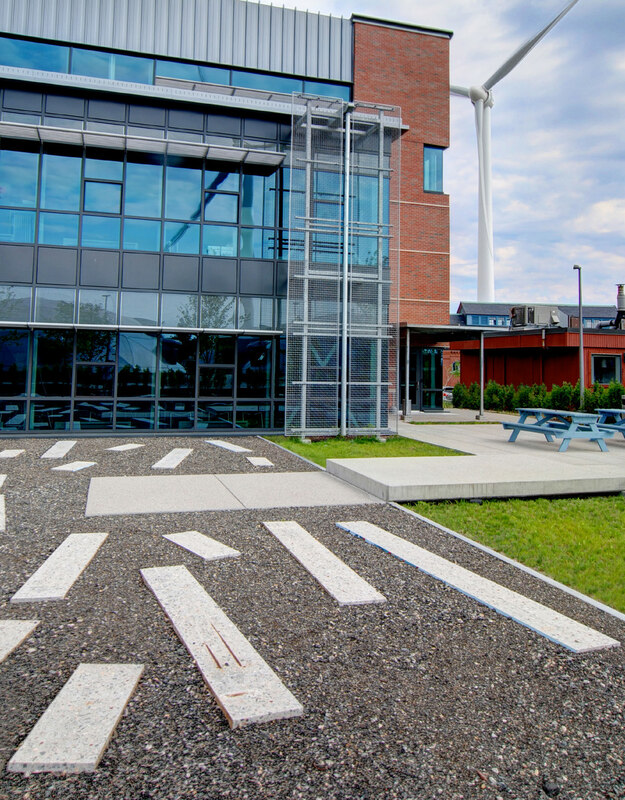 The Administration Building and its surrounding landscape are designed to raise community awareness of stormwater runoff in cities with combined sewer overflow systems, one of the most serious environmental issues threatening the health of the Narragansett Bay. The building itself acts as an educational tool for demonstrating some of the best practices for low water usage and stormwater infiltration. The new 10,000 square foot Landfill Garden, located to the south of the new Operations Center, performs as a water infiltration and filtration system integrated with an outdoor room for staff and for educational groups that frequently tour the center. Over 90 tons of demolition debris, harvested from the project site and diverted from the landfill, is reused in the construction of the garden. Concrete planks (sawn from an existing ash storage tank) and crushed asphalt (from an existing parking area) are recycled in the garden into a striking black and white garden surface. Rainwater is collected and distributed by a system of planted roof terraces and rainwater collectors that direct water into infiltration beds. 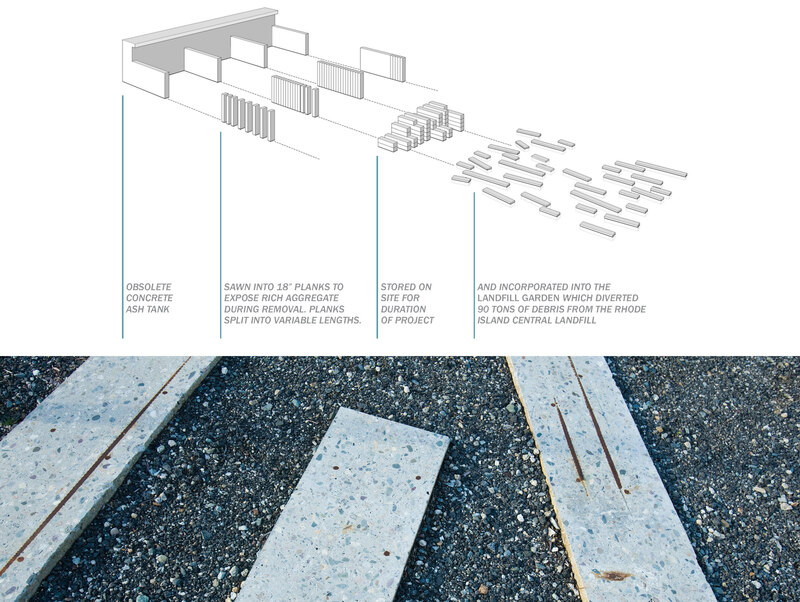 On-site infiltration, retention, and reuse of rainwater supports the project’s initiative of reducing contaminated urban and suburban runoff into Narragansett Bay. Two long, rectangular infiltration beds align with the roof drainage system to collect rainwater which is then distributed into the infiltration beds. 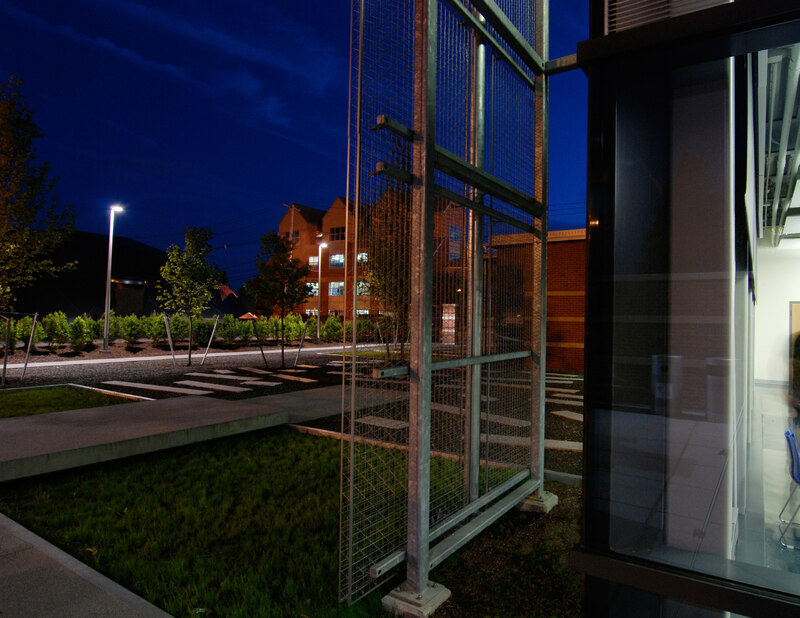 These beds are framed by recycled steel C-channels which extend perpendicular to the Operations Center south facade. The eastern infiltration bed is spanned by a cantilevered concrete bridge that aligns with an existing sidewalk connecting the former operations center with the new operations center. 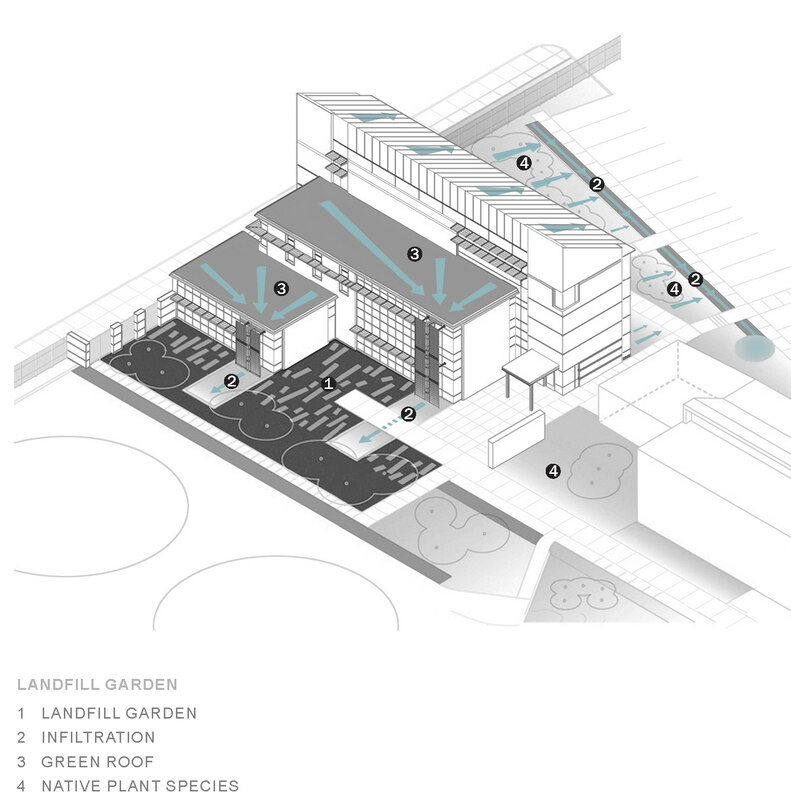 This continuous line visually anchors the Landfill Garden into the adjacent context. Planks of sawn concrete were aligned with a linear grain across the garden. These planks were sawn from an ash tank that formerly existed on the site. 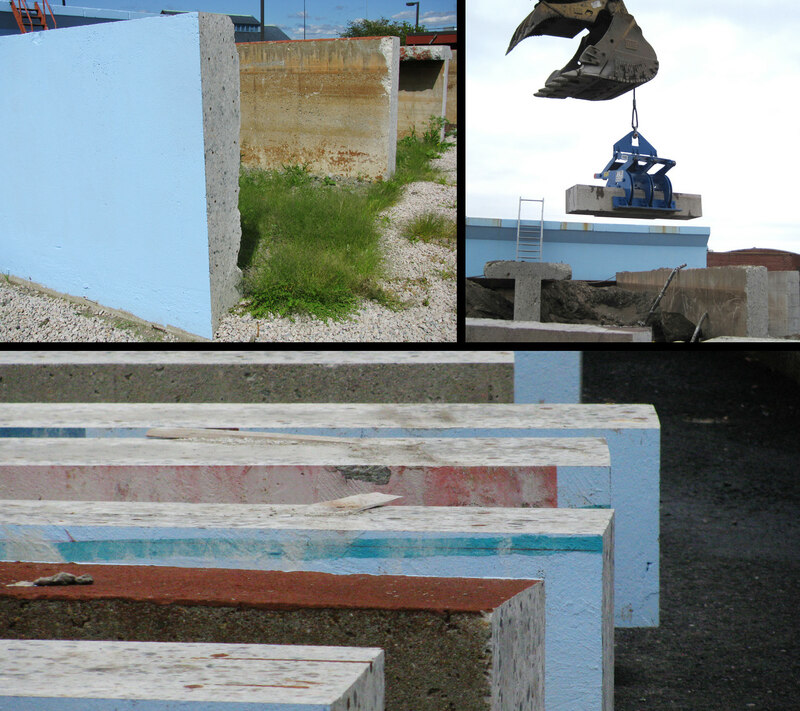 When demolition of the ash tanks began, the landscape architect noted the richly colored aggregate that became exposed with initial saw cuts. Following several meetings discussing the idea, the landscape architect and architect were successful in convincing the client to agree to recycling this material slated for demolition and allow it to be incorporated into the landscape. Further efforts to recycle other material on the site resulted with the landscape architect receiving approval to use crushed asphalt for the garden as well as excavation material for use along the meander of Nyssa sylvatica, tupelo, north of the Operations Center. The crushed, recycled asphalt establishes a chromatic continuity with the prevailing asphalt surfaces throughout the wastewater treatment facility. The concrete planks are set into this dark, textured matrix where residual paint — including a striking cyan blue which was then used as the color for the staff picnic tables in the garden — rewards closer inspection. Coastal plant species were selected for their resilience and to initiate the repopulation of the species on the peninsula of land on which the Narragansett Bay Commission is situated. Nyssa sylvatica (black gum, tupelo), native grasses, and Itea virginica (Virginia sweetspire) inhabit earthwork mounds which are partially constructed with soil excavated from the site in preparation for the construction of the Operations Center. Acer rubrum (red maple) trees are planted in the crushed asphalt field which is framed by Clethra alnifolia (summersweet). The infiltration beds are planted with native wetland seed mix. 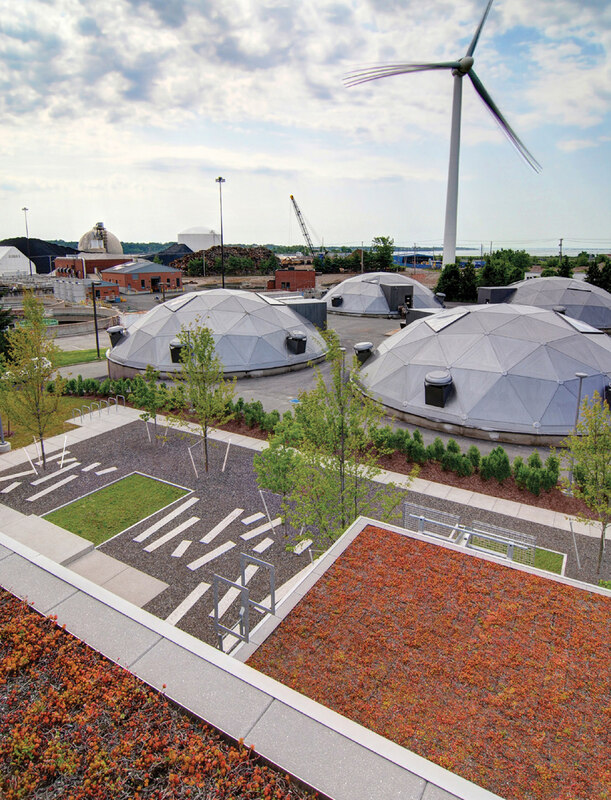 Committee approved an appeal to allow the use of an extensive green roof on the Narragansett Bay Commission Operations Building which was previously precluded due to the proximity to the hurricane-prone shore of Narragansett Bay. This is the first green roof to be approved under the 2006 IBC Building Code and this victory establishes a national precedent and is an important milestone for the approval of extensive green roof systems in hurricane prone zones throughout the United States. 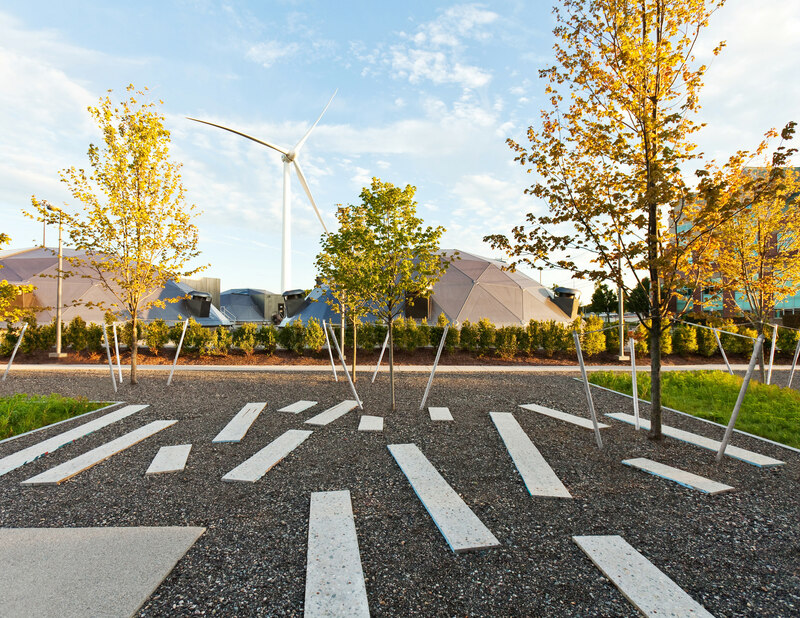 The Wind Farm was part of an overall integrated campus plan for innovative energy and water systems that included the Landfill Garden. The Narragansett Bay Commission received Federal Aviation Administration approval to install three wind turbines each with maximum heights of 360 feet at the Field’s Point Waste Water Treatment Facility. Following that, the City of Providence Zoning Board of Review granted a height restriction variance for three wind turbines, Rhode Island’s first wind farm. 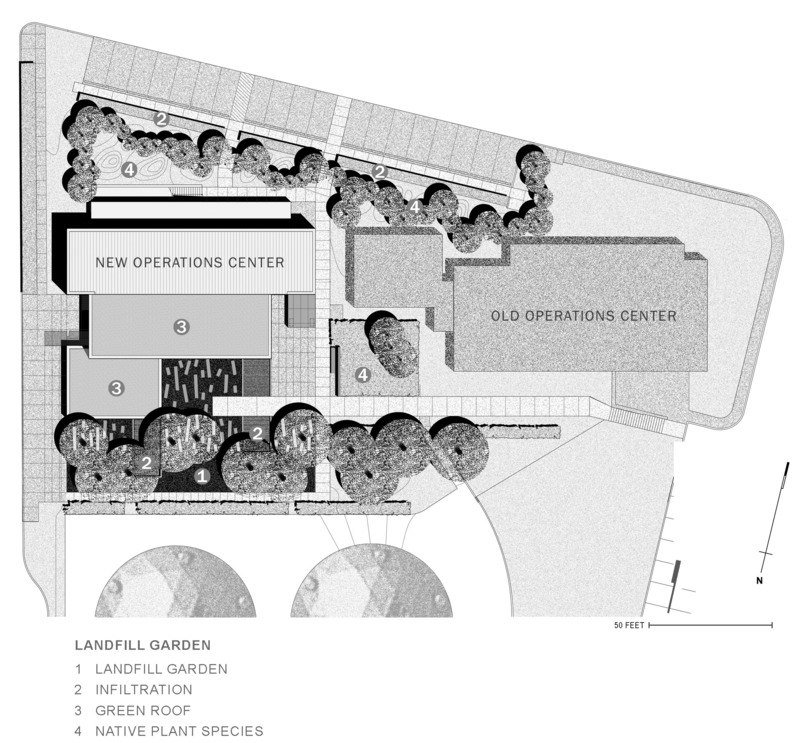 The Landfill Garden is a visually powerful black and white garden constructed with on-site construction debris. 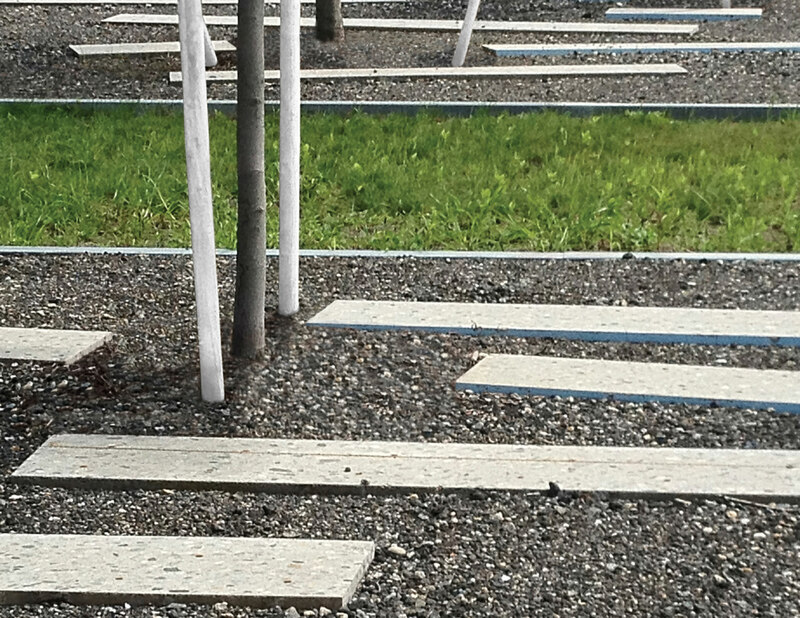 A drift of red maple trees provide passive solar protection to the garden and south-facing windows of the new Field’s Point Wastewater Treatment Facility. The garden is furnished with blue picnic tables for staff breaks and also serves as a public education center that demonstrates high performance infiltration landscape techniques. This entry was posted in News on December 16, 2013 by rhodeislandasla.